Police are attempting to trace the owners of two cars in connection with a distraction burglary in Chichester. An elderly woman reported that a man knocked at her address in Shopwhyke Road on Saturday, May 21, and offered to carry out some gardening work. Once inside, he stole a wallet and cash before making off, Sussex Police said. A small dark coloured car and a dark silver Ford Mondeo were both seen parked in the area around the time of the incident, and officers are appealing for the owners of these vehicles to come forward to assist in the investigation. Police have described the suspect as a white man aged between 20 and 40, of slim build and with short black hair. Detective Constable Gavin Percival, of the Bognor Regis Priority Crime Unit, said: “This is one of the lowest forms of crime someone could commit, and one which no one can be proud of. “If anyone has any information that may assist, we would be grateful to hear from them. 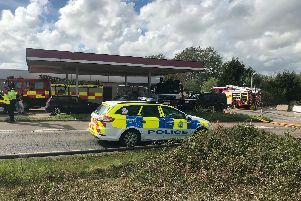 “In particular, we would like to speak to anyone who travelled along this road, east of the Oving traffic lights, around the time of the incident, and anyone who may have a dashboard camera fitted. This simple device may have evidence that court assist us in this enquiry. Anyone with any information is asked to contact 101@sussex.pnn.police.uk or call 101, quoting serial 1021 of 21/05. Alternatively, people can call the independent charity Crimestoppers anonymously on 0800 555 111 (www.crimestoppers-uk.org).